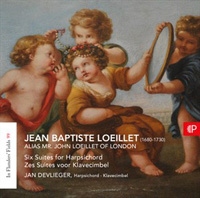 JEAN BAPTISTE LOIELLET (1680-1730): 6 Suites for Harpsichord. Description: John, as he was known in London where he spent most of his career, was the only member of the Loeillet dynasty to write harpsichord music, publishing two volumes of music for harpsichord or spinet. This release, featuring the six 1723 suites, is the first complete recording of this somewhat neglected “Flemish Music for the Harpsichord” and its style combines French grandeur and elegance with Italian velocity and lightness. Jan Devlieger (harpsichord).